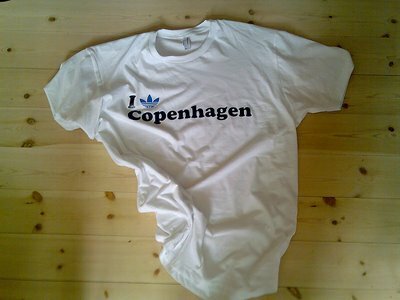 Adidas decided to take advantage of the Copenhagen Fashion Week and launch a new store in Pilestraede, Copenhagen. 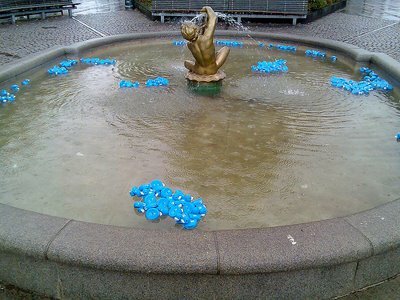 They filled the fountain pool at Enhave Plads with small blue rubber ducks. On the side of the ducks it says: "I've swum too far - help me get back home!" And on the bottom it says "Reward for my return at adidas Original store". Traded my rubberduck for a t-shirt. they got permission to use the fountain. Yeah, but it's better than anything else out there...Nike?..Please. I'd just keep the duck. I'd keep teh duck as well! I love the duck! that's a killer t!... rockstar. i had these other pics, but ima stick the t-shirt one on my site too. i want that shirt. it's stellar!!! i love this idea. totally random and cute and people want to take one home. that's exactly what companies want when they put their name on anything. smart. 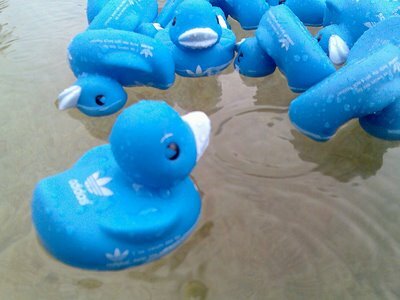 Rubber duck for a shirt is not bad. You should have picked all of those who floated.